So, with nary a male in sight, a dozen enterprising women set sail on three boats from Deltaville’s Fishing Bay Yacht Club (FBYC) on an exquisite fall weekend. Some were smarting from bad experiences with men who barked orders or expected to be served. Others had spouses who eagerly encouraged them to gain confidence and skills, and single-women, whether by choice or fate, skippered their own boats with strength and finesse. Whatever our stations, all twelve felt empowered and believed that together, we would learn something new. Yes, we knew that many highly competent sailors are women, including circumnavigators and Olympic racers. But that didn’t lessen our own feelings of accomplishment from just stepping off the dock. Eating wisely and well was a top priority, so we asked local fitness and cooking expert, Nica Waters, to plan our meals and oversee us in the yacht club’s commercial kitchen. Nica produces a long-running weekly YouTube video series called Tasty Thursdays, and I was eager to see how she translated meals on shore to meals on board. An FBYC member who often caters dinners for large regattas, she has cruised extensively on her 28-foot Bristol Channel Cutter, Calypso. Talk about a compact galley! She has mastered the preparation of delicious meals that taste as beautiful as they look, are healthy and would complement a nice red or chilled white wine. That’s what we had in mind. How many cooks can squeeze into one kitchen? Well, believe it or not, under Waters’s direction everything and everyone worked together like a well-tuned rig. We chopped vegetables, sauteed ground turkey and wrapped up Thai spring rolls. We created mocha toffee cashew bars, assembled fresh fruit parfaits and baked pumpkin spice muffins. In less than two hours, we had prepared and packaged lunch, appetizers, dinner and breakfast for us all. We were eager to cast off, if only to begin eating. We kicked off the week with ideal conditions—ten knots of wind and blue skies. There were five of us on Soulemate, my Ericson 38. 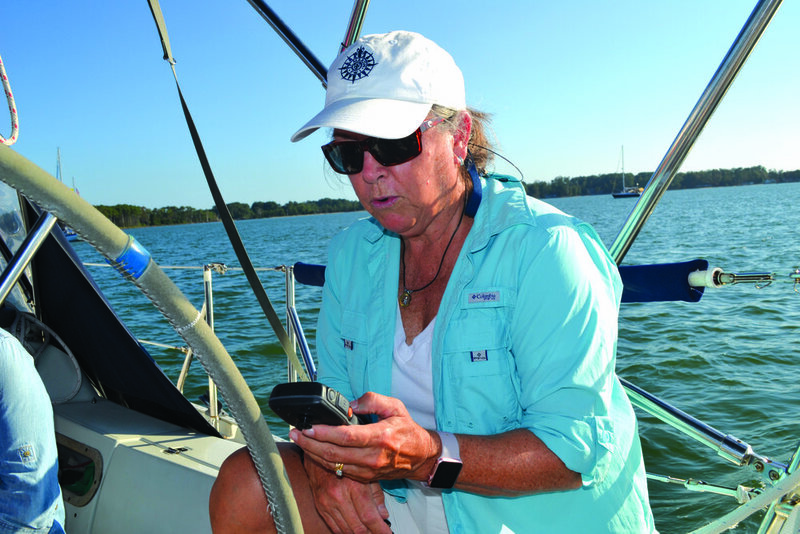 Judy Miller, the owner of See Nurse, a Hunter 365, had a crew of two, and Diane Simon skippered her Beneteau 331, Happy Place, with three others. We had promised not to tell too many tales about men and their foibles, and we were determined to push outside our respective comfort zones. We weren’t going very far, just three hours away to Little Bay, tucked in behind Windmill Point just north of the Rappahannock. Once underway, we pondered a serious question: Why are so many women reluctant to use the radio? For me, I feared sounding foolish over the airwaves. “Calling the big ship off my port bow,” or something lame like that. It wasn’t until we had installed an AIS (Automatic Identification System) and I could hail a ship by name that I banished my hesitation. So, we decided some practice was in order. Our self-proclaimed “VHF Virgin,” Nancy Powell, picked up the mic and hailed our sister ships. “See Nurse, See Nurse this is Soulemate. See Nurse, switch and answer 6-8.” That’s all it took. One successful radio transmission and Nancy had become a pro. Her success became our success and her fear of using the radio vanished. Before long, and using our joint local knowledge, we skirted just inside Windmill Point Light, crossed over the shoal in 12 feet of water and turned west. (This is the Bay’s only mark where I am comfortable going inside.) We cruised into Little Bay, needing to reset our anchor only once after swinging too close to a crab pot. With loads of scope out and a snug anchor, we could get down to business. We wanted to conduct some WOB (women overboard) drills from Soulemate. I was curious to see if our 20-year-old inflatable life jackets still worked. We had changed the CO2 cartridges in the past, but the bladders were still pretty old, and, frankly I had never seen one in action, so why not? Sailing novice Julie Simpson, eager to be a team player and “wet guinea pig” jumped into the warm waters properly outfitted. She pulled the cord and it inflated with a bang. Unfortunately for Julie, who stands barely over five feet tall, when the jacket expanded it significantly bruised her upper arms. If that weren’t enough, when she got back to the boat, she realized her arms weren’t long enough to reach around the very large inflated bladder to climb the swim ladder. It’s something to think about when choosing an inflatable. This brought us to our next phase of WOB training. While Julie cheerfully floated below us, waving to other boaters and attracting as much attention as she could, we deployed our Lifesling under conditions that rarely exist in real life: at anchor, no wind, lots of laughing on board. Yet when Julie, who was conscious, fit and eager to try anything, had to ditch her jacket to get the Lifesling around her, we all realized it wasn’t as easy as the diagram on the cover suggested. I decided to let my crew experiment and try to hoist Julie back on the boat without any direction from me. First, they attached the spinnaker halyard to the sling. But that didn’t work—Julie was too far aft of the mast for the halyard to run properly. Then they attached the main halyard to the sling, running it back to the self-tailing primary winches in the cockpit. But here again, one woman, alone, couldn’t work the winch and at the same time guide Julie’s lifeless, giggling body over the lifelines and onto the deck. By now our guinea pig was enjoying herself way too much. While the crowd looked on, I took charge and half-hoisted, half-hauled her on board. She was eager to be revived with some medicinal wine and appetizers. What did I learn? I learned that I don’t know how to retrieve someone from the water all by myself. Our collective take-away was this: Every boat needs a plan and everyone needs to practice it. Our experiment was a sobering lesson, and we resolved to change that situation. There is nothing, absolutely nothing, like freshly brewed coffee after a peaceful night at anchor. Though our own pumpkin muffins and fresh fruit parfait added to the delightful ritual. The crews on board See Nurse and Happy Place elected to dinghy ashore to explore the mile or two of sandy beach, which makes Little Bay such an enchanted anchorage. Soulemate’s crew decided to languish on deck for a few more minutes before heading home. We hoisted anchor effortlessly—at least it appeared that way from my perch back in the cockpit—and aimed for Red Number 2, leaving two sets of pound nets to starboard. That pretty much summed it up. We did not, however, sail to France.